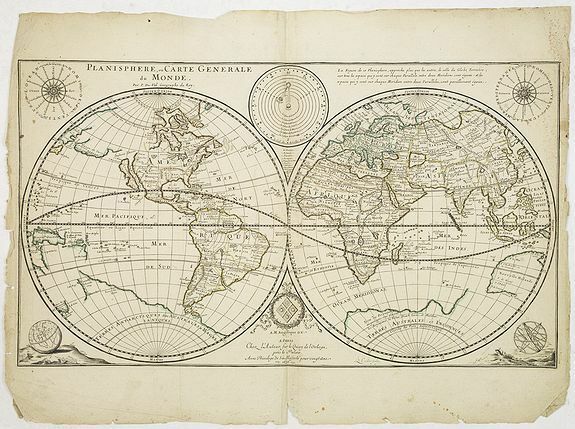 95 DUVAL, P. Planisphere, ou Carte Generale du Monde. Paris, 1676. Limites en col. ancien. Angle sup�rieur gauche consolid�. - Top left corner expertly repaired. Original outline colours. 335 x 590 mm. � Troisi�me �tat. Carte grav�e par Louis Cordier. Au-dessus des h�misph�res des diagrammes figurent les orbites plan�taires et les vents. - Third State. Engraved by Louis Cordier. 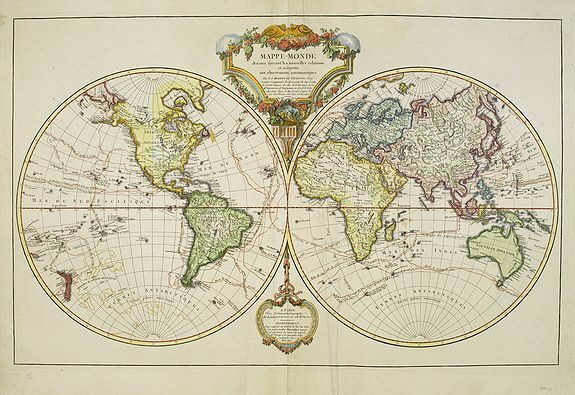 The two hemispheres generally follow Sanson's latest world map of 1660 except for the unusual, and less accurate, representation of Australia. Du Val has also retained a prominent southern continent. Outside the hemispheres, at the top, there are circular diagrams showing the compass points, winds and planetary orbits : in the bottom corners a small terrestrial globe and an armillary sphere. - Shirley, World, 441. 98 ROBERT DE VAUGONDY, G. Mappe-Monde dress�e suivant les nouvelles relations. . . Paris, Delamarche, 1804. Col. Quelques marques de plis. - Coloured. 478 x 740 mm. � Mappe-monde divis�e en deux h�misph�res. Corrig�e et augment�e des d�couvertes du Cap. Cook� de celles de La P�rouse en 1801, de Vancouver, de Mackensie, en 1802, et de toutes celles faites dans la mer du Sud� - There is particular detail for the Pacific basin, with tracks of Cook, Anson, and Tasman. Later addition with extra title information: "Augment�e des D�couvertes � de la P�rouse, 1801, de Vancouver, de Mackensie, 1802". 99 CELLARIUS, A. / VALK & SCHENK. Hemisphaerii Borealis Coeli et Terrae Sphaeri Cascenographia. Amsterdam, Valk & Schenk, 1708. Col. d'�poque. Bel exemplaire en col. d'�poque. Infimes rousseurs, petite fente marginale en bas du pli central. - In attractive original colours. 420 x 490 mm. � Magnifique carte c�leste repr�sentant l'h�misph�re bor�al issue de l'atlas de CellariusAtlas Coelestiset r��dit� par Schenk et Valk en 1708. Andreas Cellarius (active from 1656-1702), Dutch mathematician and geographer, rector of the Latin School at Hoorn. He may have been of German or Polish origin, with the name of Keller or Kellner. 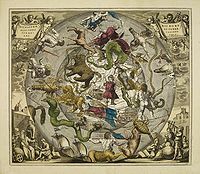 Cellarius adopted the system of Julius Schiller who renamed all constellations known at that time and sketched them again in order to fit the sky into a system of Christian symbolism. In Cellarius' Atlas Coelestis Schiller's system has been elaborated further. 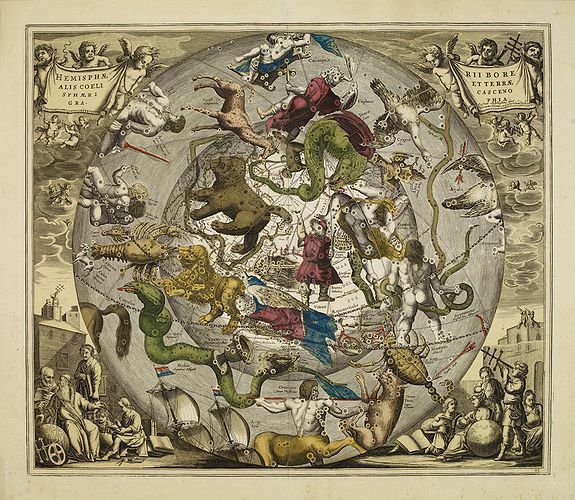 In fact, Schiller became more widely known by Cellarius' atlas than by his own work. Schenk and Valk re-published the book and added their names on the plate.